SAI Industries is recognized as one of the leading manufacturers of copper, copper alloy and Bronzes-Semies for last more than four decades. SAI believe in " Innovation As Key To Future" and have been keeping pace with modernisation in all spheres of development, manufacturing and marketing with emphasis on product quality and client's satisfaction. A professional approach and constant interaction to ensure client requirements are met with high standards within agreed guidelines of time and cost. SAI now in its fifth decade of operation has built an excellent reputation as evident by SAI's strong record of customer's retention. 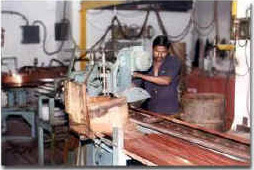 After our inception in 1969, in a very short span of 2 years SAI established its quality mark. It did import substitution in the field of thin wall tubes for automobile, electrical and electronic industries. Once again in 1976, SAI established its quality mark in the field of development of copper commutator section manufacturing. In 1989, SAI developed indigenously silver bearing copper. Recently added to our field of development is manufacture of Tellurium Copper and Phosphor Bronze Tubes. Company is managed by highly qualified team of engineers and entrepreneurs.